We are tied on skins. I am pressing on the $5 that Roy loaned me for my pull cart. 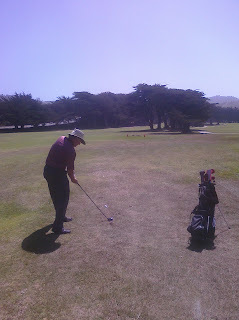 He hit a good drive, but he cannot even see my drive from here (it is near the shadow of that tree in the distance ahead). You might notice that in this picture Roy's ball appears to heading left at great speed. That is because it is. It got lost in the trees along the left side.